The short eleven year eight month career of D7524/25174 was spent allocated to only four London Midland Region depots. 25174 was the 13th Class 25 withdrawn, one of two retired during September 1976. 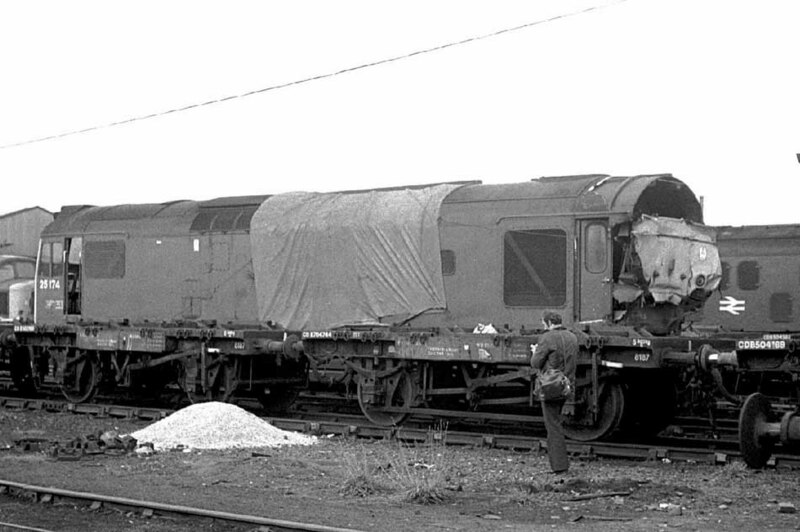 25174 was withdrawn following a collision at Aylesbury on August 5th 1976 involving 25030 and runaway wagons. 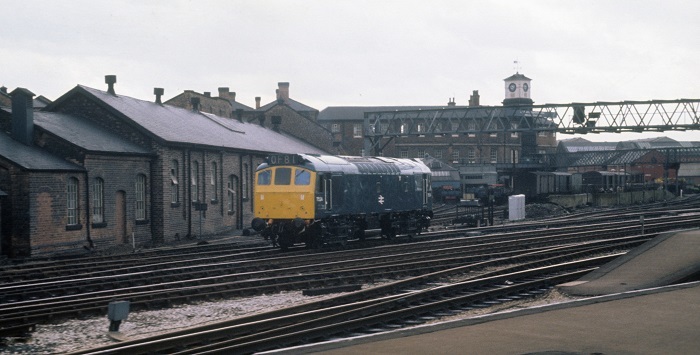 It was initially moved to Cricklewood before forwarding to Derby with 25030 on August 9th 1976, lingering here for two years until scrapped in August 1978. Photograph courtesy Tony Sayer 25174 had been withdrawn from Cricklewood during September 1976 after a collision in the Aylesbury area. The locomotive was moved to Derby Works, ironically at the time of the 1976 Derby Locomotive Works Open Day it was visible to the visitors as it sat in the arrival sidings awaiting entry into the Works. In this view dated November 27th 1976 the locomotive sits in the Works yard. 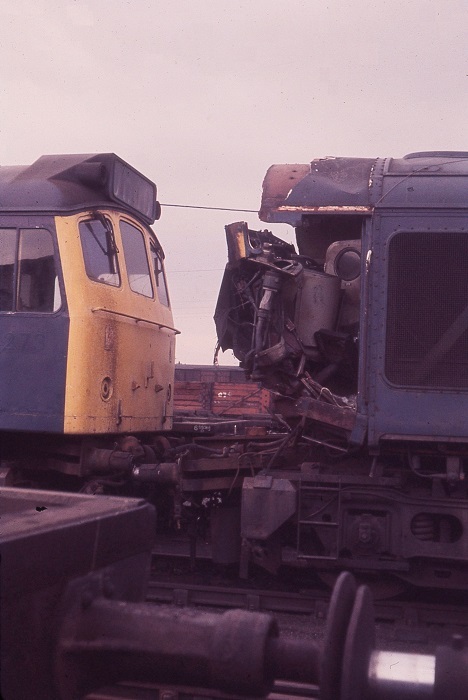 A close up of the damaged cab of 25174 on January 8th 1977. In better times repairs might have been sanctioned for this locomotive but with a downturn in business and an excess of the lower powered locomotives, there was little incentive to authorise repairs. Noted Derby Works February 1974. On July 6th 1965 the 13.00 Birmingham - Derby local was rescued at Coleshill by D7524, which assisted the diesel multiple unit at least as far as Burton. On September 7th 1968 7524 worked the 07.06 Derby - Yarmouth as far as Norwich. 7524 & 7649 worked a roundtrip (?) Nottingham - Morecambe mystery excursion on July 26th 1970, for a total of 271 miles. Photograph collection of Roger Geach. The date is believed to be 1972 as an ex-works 7524 ambles by part of Derby's railway history. January 13th 1973 found 5218 & 7524 in use between Windsor and Wembley on an excursion from Huddersfield. The journey set out behind 269, with the intention to use E3136 from Stockport. As the electric was unable to heat the train the Class 40 ran through to Mitre Bridge Junction, where 6516 took over for the leg to Windsor. As this machine also could not heat the train the Class 25’s were found for the first part of the return leg. Late in the evening of May 25th 7524 was noted at Stonebridge Park. 25174 was withdrawn on September 20th 1976. Page added June 10th 2013.